Antivirus companies require a lot of manpower, time and resources for their software to keep up with the latest malware created by the bad guys who are always trying to be a step ahead. This is why a large proportion of antivirus software packages are subscription based that require an annual renewal payment in order to continue downloading the latest definition and engine updates. Fortunately there are quite a number of reputable and popular antivirus companies such as AVG, Avast, Avira, Ad-Aware, ZoneAlarm etc, that offers a freeware version of their antivirus software for computer users to install and protect their computer from malware. Although the free antivirus products are absolutely free to use, most of the time there is a catch where you will most likely find some features that provide additional protection being disabled. Other than that, the word “free” does not necessarily mean without limitations or restrictions. If you read the long and boring End User License Agreement (EULA) that is displayed during installation which most of us ignore and blindly click on the Agree button to continue the installation, it contains very important information to where you can install and use their free antivirus software. Most of the time a free antivirus is intended only for non-commercial, personal home use while academic institutions, business, commercial, corporate or government use is prohibited. You or your company can be heavily fined if it’s discovered you’re breaking the license agreement. For your convenience, we’ve reviewed all of the free antivirus license agreements and compiled a list of those that can be used without restrictions. The URL to the official agreement and screenshot is also included as a proof to this research. The free version of Immunet antivirus doesn’t have any restriction in usage at all. You can use it for both personal and commercial purposes at any place including office, servers, education facilities and etc. You can find this statement on ClamAV’s FAQ webpage question number 4. Both ClamAV and Immunet have been acquired by SourceFire which is why you’re seeing Immunet’s FAQ posted on ClamAV’s website. NANO Antivirus can be used without any restrictions and this information is posted at their website in License Agreement page. Many people would have thought that Microsoft Security Essentials is free to use without any limitations as long as the Windows operating system is genuinely licensed but unfortunately their licensing terms say differently. According to the first point in the Microsoft Security Essentials license terms page that is posted on their website, you are only allowed to use the software on up to 10 computers if you operate a small business. MSE usage in Government or academic institutions is restricted. UnThreat Antivirus EULA didn’t contain very clear terms of usage stating that their free antivirus can be used on commercial. We’ve contacted them using their official contact form asking them if their free antivirus can be used used for corporate, commercial or educational facilities. 5 days later we received a reply from them confirming that the “free version of UnThreat, may be used without any licensing fees”. Please see screenshot below for proof. Avast! free antivirus is strictly prohibited for commercial use but it is allowed for certain non-profit educational institution or non-commercial public library in the U.S.A. Check their EULA PDF file point number 2. The legal notice page only said that the free version cannot be used for commercial purposes or in corporate environments. 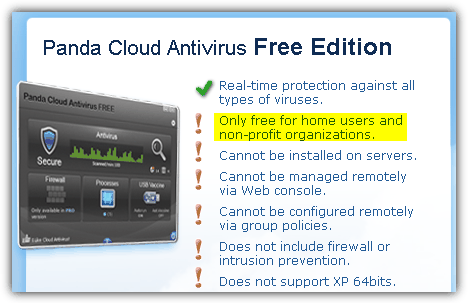 However, if you go to the “For Business” page, you can see clearly that the Panda Cloud antivirus free edition is only free for home users and “non-profit organizations”. Any free version of ZoneAlarm products can be used for a not-for-profit charitable entity excluding government and educational institutions. You can find this information on their official end user license agreement page point number 2.1. We’ve also checked the end user license agreement for the free antivirus of Ad-Aware, AVG, Avira, Bitdefender, Clearsight, Digital Defender, Kingsoft, Outpost Security Suite, PC Tools, Preventon, Returnil System Safe, UtilTool, Zillya! and they are all strictly for personal non-commercial home use only. A must have favorite link! About Comodo Cloud Antivirus license appears to be limited to users with admin rights. You forget to add the solution ClamWin (the antivirus) + ClamSentinel (a realtime protection that uses ClamWin). What about Sophos Home and now it’s Premium beta for free? Nano is not free in commmercial use anymore. Thanks for sharing lost of free antivirus such as Avast antivirus, thanks for sharing. Free FortiClient can be used in companies, based on what they say at forum.fortinet.com/tm.aspx?m=125170. Clearsight has also released a free antivirus for business customers. It provides its user with essential protection against viruses and spyware, daily updates, removable device infection detection in one easy-to-use and lightweight client. hello there, anyone know if agnitum outpost free can be used commercialy? Avast has quietly released the first cloud managed multi-platform business security offering for free. It’s called Avast for Business. By the way.. no seat limits.. no time limits.. no limits. Free for business. Your information about Comodo Anti-Virus seems to be out of date. Please correct me if I am wrong, but it appears that Comodo AntiVrus 2013 is free for home and home office use. This means that anymore than 5 workstations and you have to pay for it. There may be older versions that were free for commercial use, but they are not listed on their site. I hope I am wrong, so if you can supply a link that clearly states that this software is free for commercial use, I would love to see it. They also offer 10 free licenses for their CESM product to get you started which you can use on servers as well as workstations. Is forticlient also a free product ? FortiClient Lite is a free product, but we couldn’t determine at the time of writing whether it’s free for commercial or just personal use. The license agreement and manual seems very unclear about it, the same applies to the other products in the “Unknown” category. Rising Antivirus – at least the version I used – is USELESS. I tried it because it was the very last antivirus that would run on Windows 98. It won’t even detect the EICAR antivirus test file! Excellent article and perfectly timed! I needed to find some antivirus solutions that our IT group could recommend to other businesses in situations where they weren’t willing to pay for antivirus and this article was what I needed. Thank you! So I also wonder if you could post an article about free anti-malware software that can be used commercially? thank you for the useful info ! About MSE, it says small bussines can use it on up to 10 devices, and educational institutions are not allowed to use it. Now, in Widows 8, MSE is installed by default. As a school about to rool out Windows 8 to 300+ computers this year, where does that leave us? Do we really have to explicitly remove MSE from our base installation image? There’s a reason why it is called Windows Defender in Windows 8 although it is claimed to be the same as MSE. Do you know how are Microsoft Security Essentials restrictions with non-profit organizations? Or in another way, do you know if the 10 devices limit still apply or is it unrestricted on this condition? Thanks for this useful & informative post… God bless.. I am very glad (and the rest of your fan base) to see that you are posting again. Indeed, come Monday I am going to send this link to the IT boss of my not-for-profit group. I am sure that he will be more than delighted to receive the listing you have produced. On behalf of my IT boss and my not-for-profit . . . I would like to give, you, Raymond – – A BIG Thank You from New York! All software should be downloaded to “save”, and scanned with their anit virus software & malware software, before you even thing of installing the software. Then before you agree to the “EULA”, every one should have the free EULAyzer software that is free to download. Acts like your own personal lawyer and breaks down the “EULA”, in the software in simple terms, plus even shows you listed dangers that are embedded in the software like toolbars, third party usage, and adware. My advise is do not try and be your own lawyer, or just ignore the “EULA” agreement. I have noticed ever since the world wide economy turned down that respected software companies are installing all types of adware and toolbars that you may not want, or will cause damge to your computer. Not all corporate and non-profit organization can afford to pay for enterprise products that cost a lot of money. i know u heard this word over million times but My language doesn’t help me to thank u with other words.. Interesting article as always… I’ll take it into consideration when I help my friend setup his little office next week. Thanks! Very well said Ray. I’ve been through the ordeal of suggesting Free antivirus solutions for corporate users and come to realize that there are no reliable free solutions that can be really suggested for enterprise usage.